Ari Larissa Heinrich, tr. New York. New York Review Books. 2014. ISBN 9781590177259. One cannot be qualified to make a specialist judgment on a work and also have no preconceptions about it. 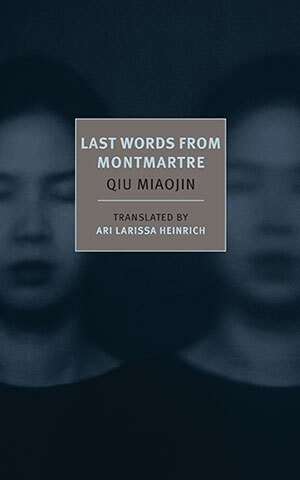 To be frank, I opened the package containing Last Words from Montmartre prepared to be enthusiastic, committed as I am to formal experimentation, queer texts, and global sinophone writing, and glad to find a rare Asian writer among the NYRB Classics. Qiu enjoys a sky-high reputation in contemporary Taiwanese literature, and reception of her in the West so far has also been warm. Then there is the biographical hook: the novel, if that is what it is, revolves around and culminates in the suicide in Paris of the twenty-six-year-old Taiwanese lesbian narrator, and was written by Qiu, a twenty-six-year-old Taiwanese lesbian, who committed suicide in Paris in 1995. But though it is a flawless translation, it is not really a good book. Bracketing the question of Qiu’s real-life death, which is responsible for much of the work’s cult status, the work’s literary merits are a particular taste at best. The book is organized in letters, most of them addressed to the distant and estranged beloved, Xu. A note tells us that we may read the letters in any order, and indeed they are neither internally cogent nor sequential. Since few plot situations or character portraits are presented, either, the result is a meandering (very French) interior monologue. The literary payoff in such a text must be in felicities of thought, language, perception, or image, since the torments of passion are in and of themselves standard fare. But, although no one could doubt the depth of the narrator’s misery, there is nothing here that one hasn’t heard once too often before. Even the occasional passage considering gender roles and identities seems now largely of historical interest. It is often unclear who is writing, or to whom, but rather than experimentality, the general impression is of a young writer unable to tame her material, while the rare intrusions of the external world—the films of Angelopoulos, the classes of feminist Hélène Cixous—have a callow quality that reminds the reader just how young Qiu was. Near the end, one reads that “an artist’s work only really moves me if the artist has suffered through profound tragedy and death—only then can greatness be achieved,” which is wrenching, but not for the right reasons. If one can’t accept such a credo, what sets in is a kind of uncomfortable intimacy with the morbid narrator, constantly presenting herself as doomed great artist, victim and paragon of passion. It is perhaps especially reading it in translation that makes the text seem depressing but humdrum—its Parisian setting, its queer eroticism, its discovery of French loves and ideas must have been so much fresher in Chinese in 1995 than they are in English today. Frank Chin. Calvin McMillin, ed. Seirai Yūichi. Paul Warham, tr. 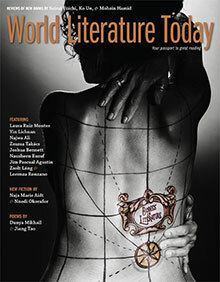 Bodies in Literature, new fiction by Naja Marie Aidt and Nnedi Okorafor; verse by Dunya Mikhail, Jiang Tao, and six Cuban poets; and essays by Ma Jian and Chris Astwood.